This exotic main course preparation consists of flavorful lamb rack crusted with herbs and spices. It is served with fondant potatoes and creamy pea puree used as a dip or a reduction. Ingredients for the crust can be changed or moderated depending on your taste and preference. Make sure you prepare extra servings as people are going to ask for more again and again. Instead of pea puree, one can also make white or red bean puree. If you're making it for the first time, pay attention to the cooking time and temperature to get the best results. So, here we go to make this scrumptious, aromatic and fulfilling lamb preparation for our weekend party. Feel free to moderate the spice quotient for this one. Savor this lip-smacking and aromatic main course recipe made with tender lamb rack crusted with delicious herbs and spices and served with fondant potato. Apply garlic mince, ground black pepper and salt on the lamb rack and keep aside for at least 15 minutes. Heat olive oil in a skillet having a heavy base and start browning each rack from sides. Brush each rack with Dijon mustard while you brown them evenly for about 4 to 5 minutes each side. Take a bowl and add breadcrumbs, parsley, rosemary, mint, processed cheese, 2 tsp olive oil and a pinch of salt in it. Mix all the ingredients with a spatula. Pat this crumbed seasoning over each lightly browned and mustard glazed rack. Roast in a preheated oven at 350 degrees for about 20 to 25 minutes till the crust turns light golden. Peel all the potatoes and give them a cylindrical drum shape with the help of a cookie cutter. Pat them with a paper to dry the surface. Heat butter and sunflower oil in a pan and brown potatoes from all the sides on a low flame. Season with thyme sprigs, pinch of white pepper powder and salt. Add chicken stock and simmer for about 3 to 4 minutes. Transfer the pan in a preheated oven at 180 degrees and cook till the potatoes become tender (about 20 to 25 minutes) from inside. Remove the remaining stock (if any) and thyme sprigs. Heat unsalted butter in a nonstick pan. Add boiled peas puree and simmer for about a minute. Season with lime juice, onion powder, garlic powder and salt. Simmer for about 4 minutes while stirring gently. Bring down from the flame and let it cool down. 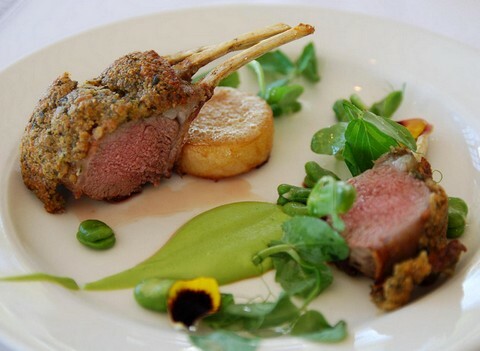 Start plating with placing 2 to 3 lamb racks in a plate with 1 or 2 fondant potatoes. Follow it by placing few spoonfuls of buttery peas puree. Finish with garnishing with fresh watercress lettuce sprigs or leaves. Serve with a glass of red wine and flavored cream.